Our cPanel web hosting packages are perfect for businesses requiring high uptime web hosting with 24/7 support and individuals & bloggers that require a reliable web hosting platform. Whether you're starting your first web site or need a solution for your business, our web hosting packages are designed to fully accomodate from the most basic to the most complex requirements. Unlimited Unlimited 5 No $4.99/mo First Month 75% Off. Pay only $1.25 for your first month of service. Unlimited Unlimited Unlimited No $6.99/mo First Month 75% Off. Pay only $1.75 for your first month of service. Unlimited Unlimited Unlimited Yes $9.99/mo First Month 75% Off. Pay only $2.50 for your first month of service. We strive to achieve excellence in customer service and offer a link to view what other customers are saying about AvailHosting. We're currently a top rated host by users on HostSearch. Transferring from another host couldn't be easier, after signup simply fill out our transfer request form and your done! Our FREE Site Builder will allow you to easily create a professional looking website within minutes! When it comes to helping our web hosting customers, we go above and beyond. Are you having difficulty setting up a forum? We can help you troubleshoot it. Script permissions tangling up your website? We can help with that too. Whatever it takes to help you succeed, we're happy to oblige. cPanel is a fully featured popular web based hosting account control panel that helps you to manage your websites, e-mails, and databases, etc. through a web browser. Our Intel Quad-Core Xeon 2.93 Ghz, 8MB Cache, Hyper-Threading, 8GB RAM, 1000mbps port servers will keep your website loading at top speed at all hours of the day. 02. Website Templates We've made dozens of professionally designed website templates available to our customers free of charge. 03. Softaculous Auto-Install Scripts Auto-install over 150 scripts including WordPress, Mambo, phpBB, b2evolution, Joomla, coppermine, TikiWiki, Pligg, and much more. 04. Multi-Language Support Our hosting control panel supports over 20 languages including: English, Arabic, Portuguese, Bulgarian, Chinese, Finnish, French, German, Greek, Hungarian, Indonesian, Italian, Japanese, Korean, Norwegian, Romanian, Russian, Spanish, Swedish, and Turkish. 01. 99.9% Uptime Guarantee We guarantee that our web services will be online 99.9% of the time during any given month. If we fall below that mark, you're entitled to a billing credit. 02. 24/7/365 Emergency Support Database corrupted in the middle of the night? No worry. Our support technicians are available 24/7/365 to handle any technical emergency. All AvailHosting customers are able to directly page our engineers with emergent issues. 03. Bi-Weekly Remote Backups We keep your data safe and protected through automated bi-weekly backups stored remotely on an independent server array. 04. Same-Day Account Setup Place your order today and we'll have your account setup today (Eastern Standard Time). AvailHosting is a top ranked web hosting, shared hosting, and cheap website hosting provider. If you're looking to buy linux web hosting, AvailHosting is the best web host on the net. We're agile, growing, and above all, committed to our work. Our mission is to provide you with exceptional hosting service. Get in touch with one of our friendly representatives to learn how we can help you succeed online. Rated a full 4/4 by HostSearch users. Instant setup on all accounts! "VERY friendly and knowledgeable! Thrilled to find a place that has exceptional customer service!" "The most enjoyable experience I've had with a host in years. AvailHosting was essential in the recovery of my online retail business." "I came to these guys immediately after a disaster scenario with another web host. Services down, database corrupt, everything had gone wrong. They transferred all of my data for me and restored service in under 24 hours. Couldn't be happier or more thankful." At HostSearch.com and other web host reviews outlets across the web we bring down top-notch reviews. We currently retain a full four-star host ranking at HostSearch. Moving from another host? No problem! 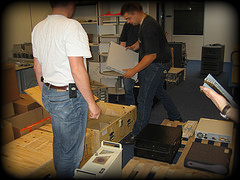 We'll move all of your accounts, e-mails, databases, etc absolutely free of charge! We'll also manage the DNS/nameserver switch to ensure that you experience zero downtime during the transfer process. We'll make the process of switching to AvailHosting simple and easy! Oak Tower in Kansas City, MO. 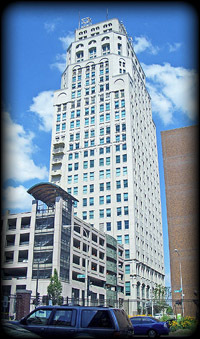 Our servers are hosted in the Oak Tower in the central business district of Kansas City, MO. The facility is fed by redundant fiber feeds from American Fiber Systems, Cogent and Level 3 (via United Fiber Systems). 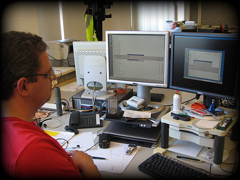 We utilize Foundry routers and switches in a parallel redundant design eliminating any one point of failure. 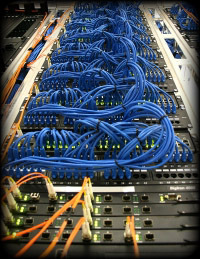 All network connectivity originates in the restricted-access networking room and travels along a vast network of CAT5e cable supported by ceiling mounted ladder racking. 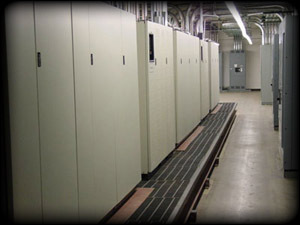 Our colocation facility is fed by three power components critical to datacenter infrastructure. The primary power supply comes from utility power supplied by Kansas City Power & Light. Designated a critical infrastructure building, Kansas City Power & Light provides three power feeds to the facility. These feeds are connected in parallel and each draws from a different independent power grid. Secondary and temporary power is supplied by UPS battery systems in the power room. We have sufficient UPS battery strength to assure continuity of power to the entire colocation and dedicated server facility. In addition, a separate UPS system maintains all critical networking infrastructure. Third and final backup power comes from a 400 kilowatt diesel generator. Fuel access points on the ground level of the building allow us to refuel the generator tanks at any time. The generator can be run indefinitely to supply power to the facility. Due to the multiple power grids coming into the building, this facility has never lost utility power. However, in the event of loss of utility power, the automatic transfer switch moves the power source from utility to diesel generator. The UPS systems supply temporary power during the time required for the generator to fire up.